Hankey Law Office > FAQs > Can I obtain disability benefits for a mental illness or psychiatric disorder? Can I Obtain Disability Benefits for a Mental Illness or Psychiatric Disorder? Long term disability benefits are available to individuals who suffer from mental illnesses and psychiatric disorders if their condition prevents them from being able to maintain an income, just as with a physical disability. However, it may be more difficult to obtain benefits based on a mental illness than a physical condition, as the effects of these disabilities are less well-known, recognizable, and harder to prove. If you are filing for disability based on a mental illness, you must be able to show that your symptoms prevent you from maintaining substantial gainful income and that they are likely to last at least 12 months. Evaluations from therapists, psychiatrists, and psychologists can provide the necessary documentation, as well as any treatment from physicians for physical conditions associated with your disability. Applying for long term disability benefits can be difficult. If you or someone you love is in need of benefits, contacting an experienced Indiana long term disability benefits attorney may be a good way to begin working towards obtaining the benefits you need. 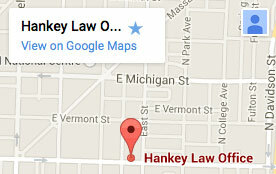 To speak with a knowledgeable disability attorney today, contact the Hankey Law Office, at (800) 520-3633.